This seminar provides the elements of understanding, screening and intervention for implementing functional vision needs into your total therapy approach. 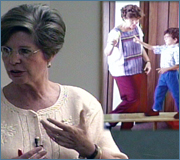 Topics include: Developmental Characteristics of Visually Motivated Behavior; The Visual Process to Use Sight; Anatomical Review; Development of Basic Visual Skills;Developmental Interference in Visual-Motor Integration; Relationships Between the Postural and Visual Systems; Functional Vision Skills and Concepts; The Visual-Cervical-Vestibular Triad; Visual Aspects of the Development of Postural Control Behavioral Characteristics in Children with Visual Dysfunction; Acuity Correction and Optometric Findings; Functional Vision Screening; Binocular Skills in Vision and Movement; Introduction to Functional Vision Training; Categories of Functional Vision Efficiency; The Use of Prism Lenses; Concepts in Strabismus. Handouts included in PDF file format. 1. 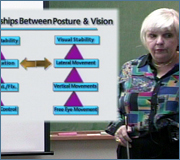 Describe the relationship between vision, movement & posture. 2. List the basic functional vision deficiencies and their relationship to learning. 3. Identify the various types of lenses used by optometrists and their purpose. 4. List the four major categories of visual efficiency and describe the functional aspects of each category. 5. 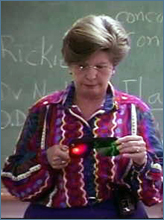 List the areas of visual screening and the purpose of each screening procedure. 6. 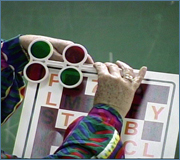 List vision therapy activities for each visual efficiency category. 7. Define strabismus and list the functional difficulties of this condition.